A weekend of sweet music: Noisy engines! 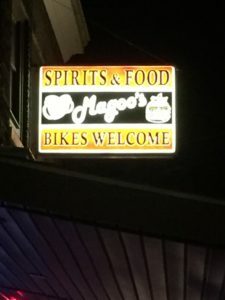 As Tom and I eased our Harleys off the gravel parking lot and onto Front Street, the guys on the porch across the street tugged on a long wooden stick hanging on a horizontal rope. Whooooooot! Whoooooooooot! bellowed the train whistle attached to the roof. Their way of saying, so long. We returned the gesture with waves and twists of our throttles. Thus concluded a short weekend at the Station Inn in Cresson, Pennsylvania. It caters to train enthusiasts. I’d read about the place in a Wall Street Journal article, and vowed to get there some day. The article was published in March, 1999. It took me a while. Robin always demurred at the idea. “Dear, if you want to go spend a weekend watching trains, have fun,” she would say, as if to add, “I’ll just stay home and perhaps watch paint dry.” My motorbiking mentor Tom, always eager for an excuse to load up his bike and go somewhere, accompanied me. Actually, being an expert back roads navigator, he led the way. I warned him, it might be boring sitting on a porch in a rocking chair watching freight trains go by. It would turn out to be anything but. 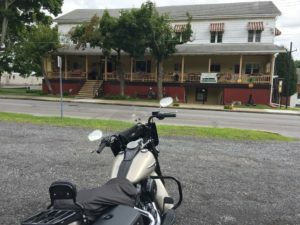 Plus, the Station Inn’s web site states, “Cresson is a regular stop for biker tour groups. We abide loud machines and their macho riders.” I’m in! So I finally made a reservation. We set out after I got home from work, changed, gassed up my Softail Heritage, Elijah, then rode over to Tom’s house. His Road King was already poised at the end of the driveway. From there we shot up I-270 ’til Clarksburg, then exited for a long afternoon of back roads at times curvy, at times hilly, at times mountainous. I love riding past farms because you don’t just see them, but smell them too. Cattle and horses generally pay no mind to motorcycles. It’s dogs and deer I worry about. A squirrel, alas, would just get flattened. 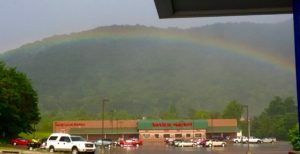 Rainbow heralded end of rain so we could proceed to Cresson. We ended up riding through one rainstorm for about 20 minutes; luckily we’d stopped in time to don rain gear. Then, as we passed through Saxton, Pennsylvania, Tom motioned me into a gas station where we fueled under one of those gigantic awnings. No sooner had we stuck nozzles into tanks, the heavens opened with a crashing thunderstorm. The cashier inside was glad to let us wait it out under the canopy for a half hour or so. A motorist called out to us from the next-over set of pumps, “There’s your rainbow.” Sure enough, a full rainbow appeared, and a few minutes later the rain cleared out. An hour later we were parked facing the Station Inn unloading our bikes. I like the sound a turned-off motorcycle makes after it’s been running a while. It produces a quiet, percussive symphony of cooling parts. What turned out to be the Inn’s regulars all stood at the rail to check out the newcomers. Because the proprietor — a Mr. Tom Davis of railroad note — was out to dinner, regular guest Billy greeted us and showed to a big, two-room suite at the end of the upper floor. Tom took the back room, away from the train tracks. I’d sleep, or would try to, next to an open window facing the tracks. Throughout the night freight trains with two, three even five locomotives would thunder past. The Inn might be homely looking, but the rooms were sparkling clean. The walls throughout are covered with pictures of trains. In the dining room where guests eat family-style breakfast, there’s a black metal plank stenciled with lines representing the tracks across the street and the adjacent rail yard, complete with lights where the real signals would be. Where do you even get an item like that? The decor includes pieces of old trains, whistles, lanterns, railroad spikes, clocks, every kind of railroad brick-a-brack imaginable. I loved it. The rooms are un-air-conditioned. During the day my front room, with the curtains moving in the breeze, slanting sunlight hitting the floor, evoked a nostalgic quality. I didn’t live in a house with central air conditioning until I was in my late teens. When no cars or motorcycles were moving up and down Front Street, and in between trains, the place was silent. At night with the windows open and the ceiling fan running I was chilly at the 2,000-foot elevation. Though it made for a fitful night’s sleep, I liked the sound of approaching trains, the clatter as they passed, and the silence that returned after they disappeared into the dark. The inn had no window shades, only sheer curtains drawn and tied, so I could get up on an elbow and see the passing lights. Sights like this keep ’em returning to the Station Inn. The best part of the Station Inn was the other guests. One man has visited for a week or so, three times a year for twenty one years! His cohorts, also long-timers, seemed to know innkeeper Davis as an old friend. Billy, a locomotive engineer for a short-line railroad, was spending his vacation at an inn devoted to train-spotting. Dan was there with two grown sons. They’d set up shop at a table on the far end of the porch. They had laptops, spreadsheets, train schedules, scanners squawking with dispatcher talk, video and still cameras, even a camera-equipped drone. At breakfast Saturday, guests all sat around the big table, chowing down thick sausage gravy on toast, fried eggs, fresh cut melon and pineapple, coffee cake, orange juice and coffee. All served by the friendliest staff ever. The conversation was all trains. My interest started with a book called “A Pageant of Trains” my father gave me when I was 10 years old. I still have it. It consists of essays and photographs of engines and cabooses from dozens of railroads throughout the country in the 1920s and ’30s. For that matter, my sister and I still make note of when there’s a “Whooooo-wheeeee” sky, a reference to an illustration by the incomparable Art Seiden in “The Train to Timbucktoo,” a children’s book we loved 55 years ago. I casually asked Mr. Davis, who sat at the same corner of the table every day, if he’d ever heard of the Pageant author, Lucius Beebe. Mr. Davis rattled off a long string of facts about the author, who died in 1966. In truth I knew little about Lucius Beebe but he was prominent in his day. I know a little about trains, but any question I had, someone could answer. What’s that part sticking out from the top of the locomotives? Radiators. How does a steam engine get going if the pistons are at the top and bottom of their stroke? They’re geared so they’re always a quarter-stroke off. What’s the grade across the street? One percent. Why is there an engine or two on the back of some trains? Those are helpers; they’ll return to help another train. Why is that train parked over there? Oh, R.J. Corman is coming in the morning to take it out of here. The guests wear T-shirts with the logos of Conrail, Nickel Plate Railroad, Pennsylvania Railroad and other defunct properties. These people are serious train fans. When they get alerts about approaching trains, they run across the street with cameras, climb up the embankment and wait. At night, the porch is equipped with a theater spotlight they shine on the passing trains. They get peeved when the engineers don’t wave. Much discussion centered on steam locomotives. The few still running are mostly tourist attractions, yet they still are held in esteem. I related, as a question, my theory that complicated machines have souls. The reaction around the table was, “Why, of course they do.” As if anyone could think otherwise. Everybody likes trains, whether you ride a Harley or a horse-drawn cart. Tom and I decided to do a little train-fanning ourselves. 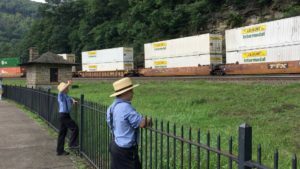 After breakfast we rode a few miles to the Horseshoe Curve landmark park, joining an early morning busload of Amish watching trains screech from one end of the majestic curve to the other. Then we rode over to the Railroaders Memorial Museum in Altoona. What struck me was how vacant the city seemed on a summer Saturday morning. Not like it might’ve been a century ago, when the city was a center of locomotive building. Anyway, the paved roads in Pennsylvania are mostly in excellent shape. At one point returning to Cresson I noticed a huge, gray pig sculpture in the driveway of one house. I thought, that’s odd. Then the sculpture started sauntering down the driveway. Saturday afternoon Tom napped. I climbed the embankment and watched a few trains close up. Such immense power. 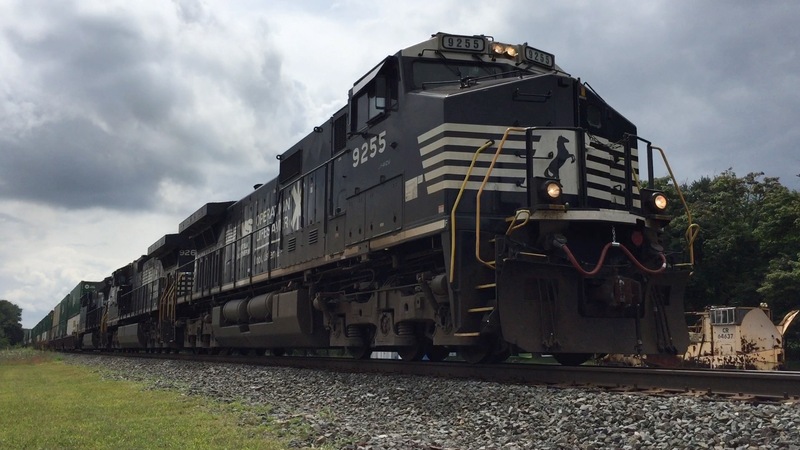 Most of the trains passing through Cresson carry the badge of Norfolk Southern, which paints its locomotives black with a set of white stripes on the front. I returned to the porch, settled into a rocking chair, opened the biography of Churchill I’ve been trying to read for five years, and dozed off. Our evening dinner consisted of two rounds of drinks — grand total, $12 — at the bar/Italian restaurant/pool room down Front Street. Later we talked at length with Billy while standing atop a train viewing platform further down the street. It was my chance to smoke a Backwoods cigar. Then it was time to load the bikes, check out, and hit the road. I thought back on the day before. A timeless moment of big breakfast, motorcycle riding, train spotting — I think it was the most relaxing Saturday I’ve had in ages.